We will often get Kettle Corn at fairs and parks in the Summer, or get togethers during the Winter. There’s no way I would buy the microwavable bags of popcorn after it came out that not only were some of the ingredients bad, but that the actual lining of the bags were causing factory workers to have cancer (that stuff goes into the air in your house people!). To make it myself, I always assumed I needed a giant kettle and open fire. Though those things do make for some amazing kettle corn, it is possible for you to make some pretty kickin’ kettle corn in your own kitchen. I tried a few different recipes. The ones that I found do not vary much in terms of ingredients. The most variety occurs is the area of technique. This is very important when trying to make Kettle corn, because it’s very easy to burn the sugar. You want to make sure your pot is hot enough, but not too hot that it scorches the sugar the second you put it in. In other words, don’t put your pot over high heat, just medium. After you get your oil heating in the pot, put just 2 or 3 kernels in it. When those pop you are ready to add the rest of the kernels. If they don’t pop, you know your heat is too low. Adding kernels before your oil is at the right temperature changes the moisture level in the kernels and can cause them to open, but not really pop where they are nice and fluffy. If you really want to make perfect kettle corn, you will add the sugar when the popcorn is already popping. But even if you have a giant pot, those popped pieces are going to be flying all over your entire kitchen if you try that. So, instead, add the sugar only after the first three kernels have popped and after you’ve added the other kernels. Get in there with a spoon and stir it all up quickly so you don’t have a clump of sugar that’s going to sit on the bottom, not move when you shake the pot, and burn into a nice black clump. We don’t want that, so timing and stirring is important. With just a few ingredients, and a little technique you can make amazing, mouth watering Kettle Corn for the whole family to enjoy. A Side Tidbit: Popcorn is not GMO yet. So, pesticides aside, if you can’t afford organic, at least it is not GMO. Add oil to a large pot (one that has a lid), and heat over medium heat (not high). Add 2-3 kernels to the oil and wait for them to pop. Once those kernels pop, add the rest of the popcorn. Sprinkle the sugar over the kernels before they start popping everywhere and stir with a spoon. Cover the pot and shake back and forth as it sits on the burner. When the popping starts to die down, remove the pot from the burner and pour the popped corn into a large bowl immediately. Don't wait or you will risk burning the popped corn on the bottom as it sticks to the sugar. Toss with salt and enjoy! Yum – I love kettle corn. And I also love that you didn’t use tons of sugar! I’ve never made kettle corn, but my granddaughters love it. I’m glad I didn’t attempt it before reading your tips. Didn’t know the sugar would make it pop wildly. Thanks. 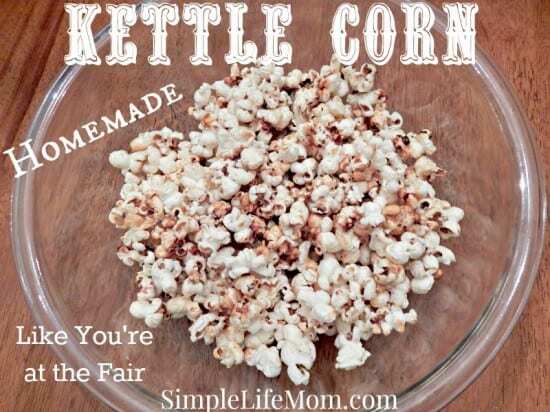 I just love Kettle Corn, this looks like a fantastic snack! Thanks so much for sharing with Full Plate Thursday this week. Hope you have a great weekend and come back soon! My husband uses organic pop corn that we buy from our local Health food store and makes it the same way you do and it is so yummy! Thanks for sharing on Real Food Fridays blog hop. Pinned & twitted. Another excellent recipe. I think I’ll be making Kettle Corn this weekend with your recipe. Thank you for sharing at Real Food Friday! We hope to see you again tonight. These are great tricks. I am going to have to try this as my daughter loves kettle corn. Thanks for sharing! Thank you. Hope you have fun! We will love your awesome Kettle Corn! Thanks so much for sharing your special post with us at Full Plate Thursday. Have a great weekend and come back to see us real soon!